This was my go to when my barbecue got rained out on the 4th. It’s really quick to put together, and also very economical as a little fish goes a long way. I served it with oven roasted corn and chipotle butter. Cut each fish fillet into four long thin strips; set aside. Mix together breading mixture and set aside in a small bowl. Whisk the egg wash together in a small bowl and set near the breading. Shred cabbage, chop cilantro and serranos, cut lime and keep toppings nearby. Sprinkle fish with salt when you start to heat cooking oil in a large deep skillet to about 2 inches. Dip fish pieces in egg, then in breading, then in egg, then in breading. Shallow fry fish several minutes on each side, or until it flakes; drain on brown paper bags. Continue until all fish is fried. Warm corn tortillas briefly in microwave and use two layered corn tortillas for each taco. 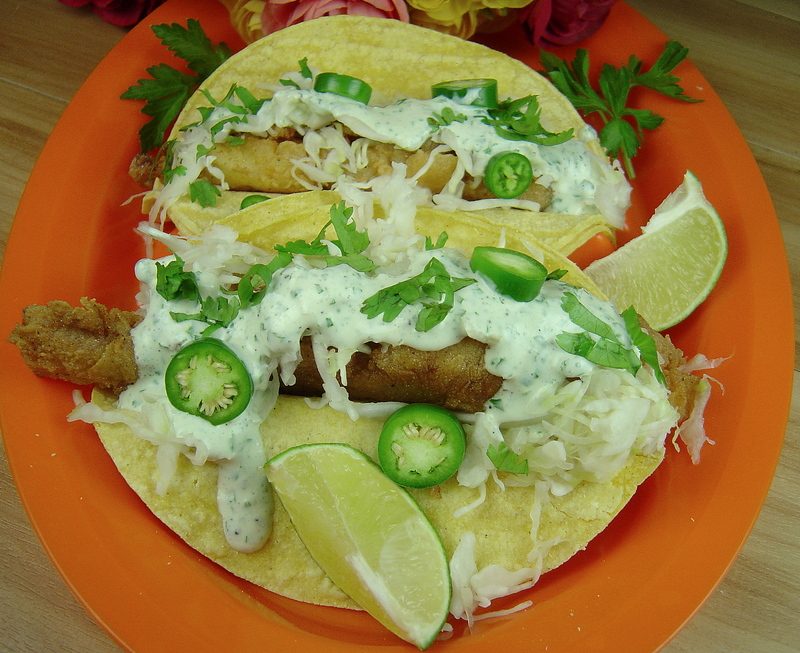 To build taco, place piece of fish on tortillas, and top with some cabbage, cilantro, peppers, and a dallop of cilantro crema.